Schedule our instructor led classroom training at your convenience and never miss another lecture or fall behind. You are in complete control. We invited the Best CompTIA A+ Certified Trainers in the industry to help us develop the ultimate training and certification program which includes everything you will need to fully prepare for and pass your certification exams. Click here to see a free Demo of our CompTIA A+ Training. Technicians who are CompTIA A+ Certified typically have exceptional communication and customers services skills.To become certified, you must pass the following 2 exams: CompTIA A+ Essentials, exam code 220-701; and CompTIA A+ Practical Application, exam code 220-702. CompTIA A+ Essentials is designed to measure whether entry-level IT specialists with 500 hours of field or laboratory experience are competent. It measures basic computer technology, security, and networking skills, in addition to professionalism standards all entry-level IT specialists must adhere to. CompTIA A+ Practical Application adds additional skills and knowledge developed during CompTIA A+ Essentials through “hands-on” training. Students utilize various tools and troubleshooting skills to fix problems. The computer industry has identified A+ Certification as the competency measurement of PC Service Specialists. More than 50 computer publications, resellers, distributors, vendors, and software and hardware developers endorse it. Those seeking careers in the IT industry greatly benefit from being certified! You can begin your computer career by completing this course. Specialists currently in the industry can demonstrate their knowledge of operating systems and hardware by finishing it. Certification Tests are administered at Prometric Testing Centers. Training is sponsored by the Computing Technology Industry Association (CompTIA). 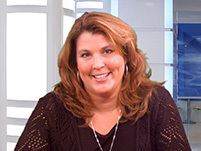 Sandra has more than 15 years experience with training in IT certification and course development. She is also a Senior Microsoft Certified Instructor who has consulted with many Fortune 500 companies about IT training. She has years of real-world IT experience designing network infrastructure, configuring Internet security gateways, LAN, and WAN, and installing and transitioning to Microsoft Exchange 5, 2000, 2003, 2007 and 2010. She has also spoken at many Adobe, Comp TIA, and Microsoft seminars and Boot Camps nationwide.